EN 60118-4 ed. 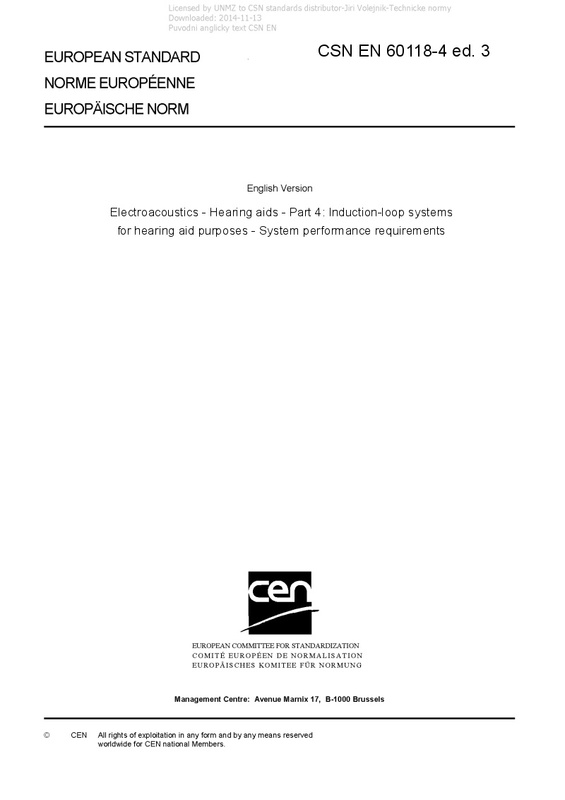 3 Electroacoustics - Hearing aids - Part 4: Induction-loop systems for hearing aid purposes - System performance requirements - IEC 60118-4:2014 is applicable to audio-frequency induction-loop systems producing an alternating magnetic field at audio frequencies and intended to provide an input signal for hearing aids operating with an induction pick-up coil (telecoil). Throughout this standard, it is assumed that the hearing aids used with it conform to all relevant parts of IEC 60118. This standard specifies requirements for the field strength in audio-frequency induction loops for hearing aid purposes, which will give adequate signal-to-noise ratio without overloading the hearing aid. The standard also specifies the minimum frequency response requirements for acceptable intelligibility. Methods for measuring the magnetic field strength are specified, and information is given on appropriate measuring equipment (see Annex B), information that should be provided to the operator and users of the system (see Annex C), and other important considerations. This standard does not specify requirements for loop driver amplifiers or associated microphone or audio signal sources, which are dealt with in IEC 62489-1, or for the field strength produced by equipment, such as telephone handsets, within the scope of ITU-T P.370. This third edition cancels and replaces the second edition published in 2006. This edition constitutes a technical revision which includes the following significant technical changes with respect to the previous edition: Addition of Annexes G, H and I where more information is provided about practical considerations and methods of measurement.